Holy Apostles College and Seminary (HACS) is one of two non-residential Colleges recommended by the Cardinal Newman Society—a huge honor and privilege for any school making the short list. See that recommendation here. With a robust catolog and an honorary team of professors, HACS is the best kept secret in Catholic education. A humble size of online students make for a 1:9 student to faculty ratio. With names like Patrick Madrid, Dr. Donald DeMarco, Dr. John Finley, Fr. Tad Pacholczyk, Dr. Daniel Van Slyke, Dr. Alan Vincelette, Dr. Philippe Yates, and Fr. Brian Mullady, the HACS student receives a top-shelf education and experience. I conducted an interview with Dr. Sebastian Mahfood, OP, who is the Associate Professor of Interdisciplinary Studies, Vice-President of Administration, and Director of Assessment for Holy Apostles College & Seminary. Dr. Mahfood is excited to tell the world about what HACS offers and what the future holds for prospective distance learning students. What degree offerings are available online? Holy Apostles College & Seminary offers an Associate of Arts in Theology, a Bachelor of Arts in History in the Social Sciences, English and the Humanities, Philosophy and Theology, and a Master of Arts in Theology, Philosophy, and Pastoral Studies. The college also has certificates available in each of its theology concentrations and sponsors a post-master’s certificate program in theology. At present, students can pursue up to 50% of their Associate, Bachelor of Arts and post-master’s certificate degree programs and theology certificates completely online and 100% of their Master of Arts degree programs completely online. Are different concentrations in Theology available? 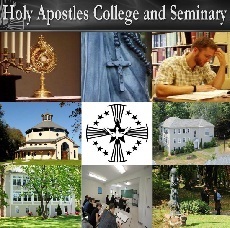 Holy Apostles College & Seminary currently offers twelve theology concentrations, including Apologetics, Bioethics (in collaboration with the National Catholic Bioethics Center), Canon Law, Church History, Divine Worship & Sacraments, Dogmatic Theology, Moral Theology, Pastoral Theology, Philosophical Theology, Sacred Scripture, Spiritual Theology, and Theology & Science. What sets HACS apart from other distance learning programs, and Theology programs in general? Holy Apostles College & Seminary is an orthodox Catholic program grounded in the teachings of St. Thomas Aquinas with a mission to cultivate lay, consecrated and ordained Catholic leaders for the purpose of evangelization. We are not only a college but also a seminary that forms priests for dioceses and religious orders across the country, and we allow our lay students to study in the same academic courses with our seminarians for the greater good of both. Our online programs are thus designed for the inclusion of lay, consecrated and ordained Catholic leaders, and we find that we have a large number of students who already have professional degrees and are able to apply their rich life experiences to the growth of the community of learners they will find in each of their classes. Our online teaching faculty are dedicated to the intellectual, spiritual and moral growth of each of our students, and this is evident in the kind of classes they build within the programs in which they teach. In this way, we are not just an academic program for lay students but a program that seeks the growth of the whole person. The student body is mostly comprised of lay, consecrated and ordained Catholics, but we welcome all persons with a desire to study in this kind of a community and have a number of non-Catholic students, Protestant mainline, Evangelical and others already working their way through a degree program. As Catholics, we understand our mission is to all peoples, and we welcome everyone with a desire to be formed in our mission. What’s on the horizon for new educational opportunities at HACS (Certificates, Doctoral, Bachelors via DL)? Holy Apostles College & Seminary expects to have all of its undergraduate offerings 100% online by early spring, 2014, and all of its theology certificate programs and post-master’s certificate programs online by summer, 2014. Throughout the spring of 2014, the college will also pursue the development of a post-master’s certificate program in philosophy. The college has a special interest in the pursuit of a completely online 36-credit doctoral program in philosophy and theology. In addition, the college has just entered into an agreement with the Adler-Aquinas Institute to offer a Great Books major on the undergraduate level, which is expected to launch in the fall of 2014, a Thomistic Studies concentration in the graduate philosophy program along with a Christian Wisdom concentration in the theology program. What career opportunities exist for a Philosophy or Theology major? Persons majoring in philosophy or theology on the undergraduate level can pursue many types of careers, including teaching in private elementary and secondary schools and working in various apostolates within their home dioceses. Many students who complete their undergraduate degrees in philosophy or theology will continue their studies on the graduate level, receiving master of arts degrees that open up new possibilities in various apostolates like chaplaincy, in diocesan or parish ministry and in teaching at community colleges or within the undergraduate programs on the university level. Some students who complete their graduate degrees in philosophy or theology will continue their studies on the doctoral level, receiving doctorates that open up new possibilities for teaching on the undergraduate or graduate levels or of working within or alongside various national organizations such as the United States Conference of Catholic Bishops, the Center for Applied Research in the Apostolate or the National Catholic Educational Association, to name a few. Holy Apostles College & Seminary is the first Catholic college ever to have offered a Massive Open Online Course, or MOOC, beginning in the fall of 2012. The college has since sponsored a few MOOCs each term into which anyone with an interest in the subject matter may enroll at no charge via http://www.hacsmooc.cc. The idea behind the MOOCs is to extend the reach of the college’s mission into those publics that are not currently part of the institution’s learning community and to make available additional study opportunities for those who are. The MOOCs that are offered every semester include Online Teaching and Learning, Teaching Research Design, and MOOC Design – each through collaboration with the Catholic Distance Learning Network. Other MOOCs are offered periodically, such as Consecration to Jesus through Mary, Dante’s Inferno, Purgatorio and Paradiso, Lenten Journey with Jesus: A Virtual Tour of Jesus’s Last 40 Days, and Atheism and the New Atheism. New MOOCs are introduced by our faculty each term, and the new collaboration with the Adler-Aquinas Institute will result in additional MOOCs offered in Great Books and in Neo-Thomism. Where can I go to learn more about Holy Apostles? To learn more about Holy Apostles College & Seminary, please visit us online at http://www.holyapostles.edu, or join one of our social media sites on LinkedIn, Facebook, or Twitter @holyapostlesedu.